Jaxon Confirms Gold-Cobalt Mineralization Extension Along Both Strike and Dip of Backbone Tourmaline Breccia Zone at Red Springs and Announces Investor Relations Engagement | Jaxon Mining Inc.
January 14, 2019, Vancouver, Canada - Jaxon Mining Inc. (TSXV: JAX) (FSE: OU31) (OTC: JXMNF) (the “Company”) is pleased to announce it has received the assay results from diamond drill holes BB18-04 and BB18-05, drilled from the same platform as BB18-03 but at different angles, azimuths and depths. Five of ten planned drill holes were completed before weather conditions halted the program. 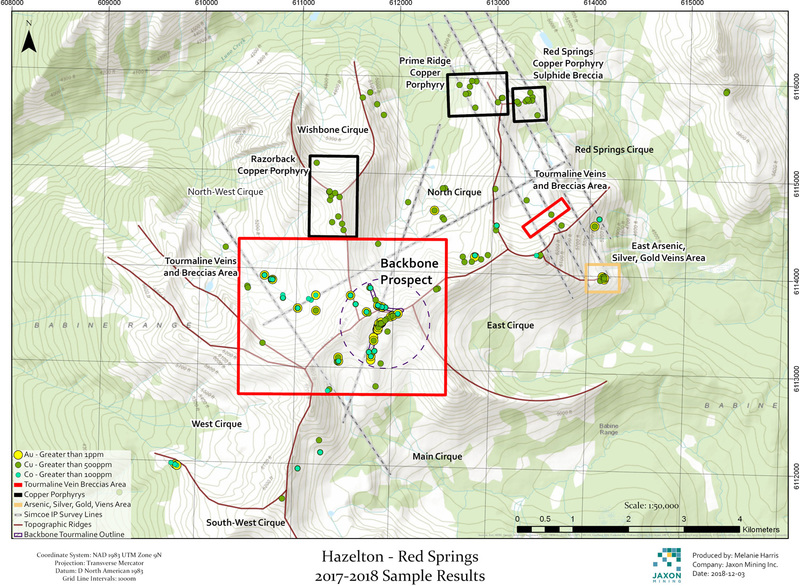 All holes targeted the Backbone gold-cobalt tourmaline breccia mineralization zones along strike at Red Springs, located 9 km from Highway 16, on the Company’s 44,000 ha Hazelton property in the Skeena Arch area of North West British Columbia. 1 EqAu is calculated using long term prices for gold at $1250 USD per ounce, cobalt at $60K USD per tonne, copper at $6K USD per tonne and bismuth at $10K USD per tonne. 2 Assay results from BB18-03 are included in Table 1 as all three holes were drilled from the same pad. Core samples were cut and collected in the core shack facility in Smithers, B.C. by an experienced, professional QP geologist. Numbered core sample tags were placed inside each bag, which were then securely closed for transport. The Vancouver laboratory of Bureau Veritas Commodities Canada received the Rice Bag shipments, after secure transport directly from Smithers. All samples have been prepared by crushing, grinding and pulverizing to a pulp with barren material washing between each sample at the crush and pulverizing stages. Then 30 g of pulp was used for the gold assay using Fire Assay code FA430, AAS finish in g/mt and over limit gold using code FA530, with gravimetric finish in g/mt. Tellurite assay using code MA270 (with Te turn on). Other elements assay used code MAQ270 (aqua regia digest with ICP_MS finish). Located in North Western B.C., the Red Springs Project contains porphyry-related, sedimentary-hosted gold-cobalt tourmaline breccia mineralization with associated copper, bismuth and antimony (Figure 3). It is in a well-developed infrastructural area and only 10 km away from major highway and 2 km from a local forest logging road. It is a new discovery for this type of mineralization in B.C. Tourmaline breccia mineralization in the “Backbone” area of the Red Springs Project is partially controlled by a low angle thrust fault occurring as sill-like tourmaline-sulfide zones within the fault and along bedding planes and as discordant breccia zones in the hanging wall of the fault. Mineralized intervals display multiple phases of hydrothermal activity accompanied by strong silicification and tourmaline-sulfide mineralization. Tourmaline-sulfide breccia zones and veins have been widely found in the Backbone, North Cirque and North West Cirque prospects. At Backbone, breccia mineralization extends over a strike length of 1000 m and is up to 15 to 50 m wide on surface (Figure 3). Gold grades from surface channel samples range from 1 g/t to 32 g/t Au, with cobalt and copper grades up to 0.36% and 8.33 % respectively. The 2018 drilling program confirmed the continuity of mineralization over a strike length of 300 m from BB18-01/02 to BB18-03/04/05 and low angle (<30 degree) dip extent of over 100 m from surface channels to the West (Figure 1). 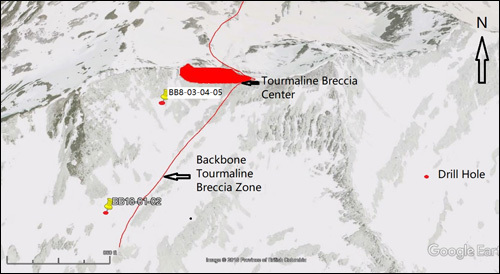 Mineralized tourmaline-sulfide breccia zones in drill core extend discontinuously over lengths of more than 26 m at a gold equivalent grade of 1.44 g/t in BB18-03 at the down hole depth from 67 m to 93 m, 20 m at a gold equivalent grade of 0.53 g/t in BB18-04 at the down hole depth from 64 m to 84 m and 21 m at a gold equivalent grade of 0.58 g/t in BB18-05 at the down hole depth from 66 m to 87 m. The assay results also confirm a 2 to 3 m wide high grade band existing under the hanging wall within approximately a 20 m wide mineralization zone with a gold equivalent grade from 2.40 g/t to 15.0 g/t at the Backbone tourmaline breccia zone (Figure 1). The Backbone tourmaline breccia zone consists of different phases of sedimentary breccia and tourmaline veins or metrics. The sulphide mineralization within the tourmaline breccia zone consists of pyrrhotite, arsenopyrite, chalcopyrite and pyrite. The most intense mineralization is associated with strong silicification and sulphidation alterations near the hanging wall. A set of late quartz-carbonate veins are concentrated within the tourmaline breccia mineralized zone and contain variable amounts of chalcopyrite and bismuthinite. The cobalt grade can be up to 0.36% on the surface outcrops and 0.10 % in the drill hole cores based on the current exploration data and is closely related to the gold, telluride and bismuth grade within tourmaline breccia mineralization in both surface outcrops samples and drill hole cores. 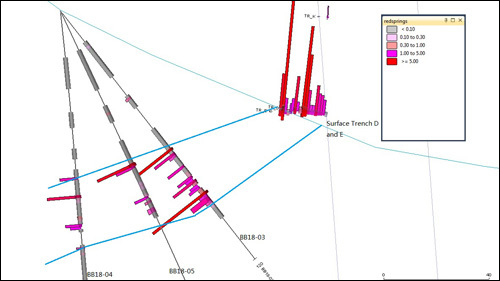 Based on the 2018 IP survey and drilling program, the Company has identified multiple high priority IP anomalies for sulfide mineralization. 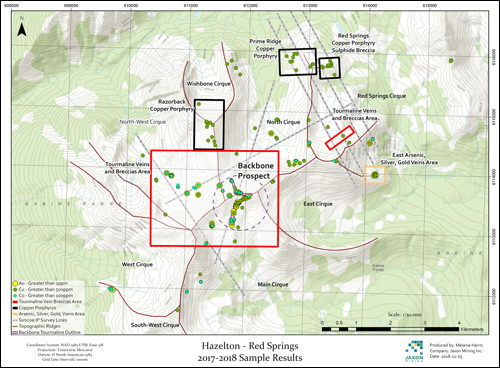 High priority IP anomalies extend from the Backbone to North Cirque and North West Cirque areas and cover a 2 km2 area at depths ranging from 350 m to 430 m. The IP survey also indicates the existence of a system of porphyritic anomalies located at the Red Springs Project area. Deeper drilling into these high priority IP anomalies is being planned for spring and summer of 2019. The objective of the Phase One drilling program was to determine the widths, continuity and grade of gold-cobalt tourmaline breccia mineralization at depth and along the strike. 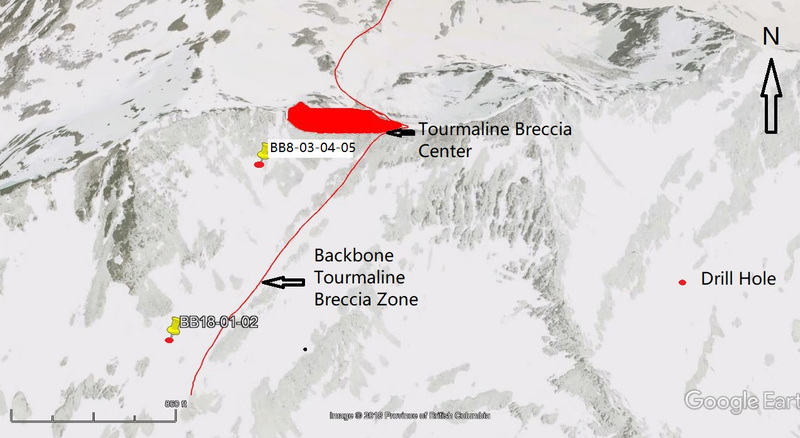 In addition, the results added to the Company’s knowledge of the nature of the tourmaline breccia mineralization and its controls. Yingting (Tony) Guo, P.Geo., COO for Jaxon Mining Inc., a Qualified Person as defined by National Instrument 43-101, has reviewed and prepared the scientific and technical information and verified the data supporting such scientific and technical information contained in this news release. Further, the Company is pleased to announce it has engaged Kaye Wynn Consulting Inc. to serve as an investor relations consultant to the Company. Kaye Wynn will assist the Company to broaden its shareholder base and create effective tools for communicating with shareholders and potential investors. As compensation, the Company has agreed to pay Kaye Wynn $4000 per month for an initial three month term. Except for the investor relations services agreement, Kaye Wynn Consulting does not have any interest in the Company or its securities. The engagement of Kaye Wynn Consulting as an investor relations consultant to the Company is subject to the acceptance of the TSX Venture Exchange. About Kaye Wynn Consulting Inc.
Kaye Wynn Consulting Inc. has developed a network of investors, brokers, analysts, media contacts, and industry professionals. Established in 2010 and based in Vancouver Canada, we work closely with our clients to get their message out to our proprietary network and the broader investment community.